While each organisation is clearly committed to its task, they each take a different approach, and there has been much to learn. Differences between the legal frameworks in Australia and Canada also make some lessons more transferable than others. one historical community law curio. Human rights legislation. Most importantly, Canada has a tiered, legislative human rights framework, which in British Columbia (BC) includes Canada’s constitutionally entrenched Charter of Human Rights & Freedoms, Human Rights Act, and the British Columbia Human Rights Code. This dramatically alters its public interest law practice, in that most of the organisations I spoke to regularly litigate on human rights law issues. This overlap in practice area appears to build both constructive dialogue, and active collaboration, between organisations. See, for example, this joint work of on welfare and child support by CLAS and West Coast LEAF. Interveners. Secondly, in Canadian law a non-party may ‘intervene’ in a proceeding, either as a matter of right or at the discretion of the court, to represent the rights of parties that may be affected by a decision, and who should ideally have the right to be heard. This mechanism allows community law organisations to regularly influence legal decision-making at the highest appellate levels. BCCLA and West Coast LEAF in particular, regularly do intervener work. Examples: West Coast LEAF intervened in this case relating to the imposition of hearing fees in family law matters; and BCCLA intervened in this case about the disclosure of intercepted communications to foreign states. Public interest standing and institutional clients. Thirdly, Canada has a relatively flexible test for public interest standing (the right to bring a case to the court) that often allows organisational clients to act as litigants in public interest proceedings. See, for example, this challenge to solitary confinement brought jointly by BCCLA and the John Howard Society. Having the option of an institutional, rather than an individual, client, arguably allows for much greater access to justice and ventilation of legal issues relevant to disadvantaged groups. This is because it does not require one person (or group of people) to endure the time, stress and pressure of public interest litigation, which often runs for many years. The ‘social determinants of health’ approach to case selection. Research has found that particular aspects of poverty, discrimination, and social exclusion have greater impacts on health outcomes than the quality of health services or lifestyle decisions. More information about the social determinants of health is available at the Canadian Facts website, which lists 14 key determinants, and on the World Health Organisation website. Centres can use this approach to prioritise their work, by selecting cases or areas of work that will most positively affect health outcomes. As an example, in tenancy work, a Centre may elect to focus on ensuring stable housing for disadvantaged communities, rather than looking at issues around residential tenancy bonds. Litigation on questions of statutory interpretation and civil procedure. My conversation with Carmen Cheung, Acting Litigation Director at the British Columbia Civil Liberties Association (BCCLA), reminded me of the importance of litigation that looks not only to substantive law, but also at matters of statutory interpretation and procedure. The concern with technical legal procedure in both areas of work struck me. In the case planning process for test cases, for example, BCCLA would closely consider to what extent the case would get lost in procedural questions such as choice of forum, or standing. For example, where an earlier case challenging solitary confinement through an individual client had settled, another case was brought in 2015 with institutional clients as a vehicle following the sufficient evolution of the law of standing. BCCLA does two kinds of work: (a) intervener work, through which it aims mostly to raise technical legal arguments relating to matters such as constitutional interpretation, or procedural fairness; and (b) test case litigation, which it builds up on a case by case basis, and often runs through an institutional client. One notable example of this latter work is the recent case of Carter v Canada (2015), in which the Supreme Court of Canada held that a law that prohibited doctors from helping competent, seriously ill people hasten death was unconstitutional. This raised questions in my mind as to what litigation work could be run in Victoria to expand the law on public interest standing, or protective costs orders, for example, for the assistance of all CLCs as well as other public interest litigants. Using academic theory to inform case strategy. West Coast LEAF is a feminist legal organisation dedicated to promoting women’s equality through law. In its case planning it will map out the feminist theories relevant to a particular case in order to inform case strategy. This may also then inform its collaboration and communications strategy. West Coast LEAF’s Executive Director, Kasari Govender, told me how integrating academic ‘blue sky’ thinking about what is possible within a campaign is a useful counterbalance to the more immediate (but equally important) needs of community. Also incorporating a theoretical perspective may assist in balancing complex strands of a debate early on. Kasari reflected on how this was particularly useful in the analysis of this case relating to a constitutional challenge to a law prohibiting polygamy, which brought in to the mix many disparate feminist considerations. (1) What kind of legal work do we want to do? (2) What is the highest and best use of the lawyer? (3) What kind of litigation work will have the greatest impact? EcoJustice answered these questions as follows: it wanted to focus on precedent-setting legal work, with lawyers doing litigation (rather than policy work), and working to maximize impact through a set of strategic priorities. Interestingly, it employs two scientists to assist in researching and buildings its test case design. Noteworthy is that its funding comes entirely from private or philanthropic sources. Finding the gaps in legal services: representing consumers’ interests in utilities pricing and regulation. Unlike in Victoria (Australia), many states in Canada have Utilities Consumer Advocates, which inform consumers on utilities issues and represent consumers’ interests in utilities rates hearings. In the absence of such an advocate in British Columbia, BC Public Interest Advocacy Centre (BCPIAC) take on the important work of representing consumers’ interests at hearings on utilities pricing and regulation before the BC Utilities Commission. They say it may have all started with ‘The Plunge’. Out of this came the first student-run community law service, started by a group of students disgruntled by the inadequacies of Legal Aid. 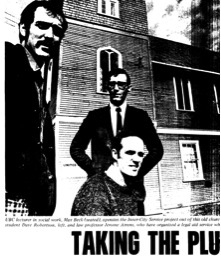 When the Project ended in 1971, the success of this legal program, and recognition of its need by the Canadian Bar and others, lead to the funding for the first community law service in Vancouver: the Community Legal Assistance Society. And to come neatly full circle: CLAS was the very place where my interviews in Vancouver started. Although quite radical now, The Plunge reminds me of Bryan Stevenson’s call for greater proximity to those in need, as we work toward justice. Tomorrow, I am off to New York, for the next leg of the journey. 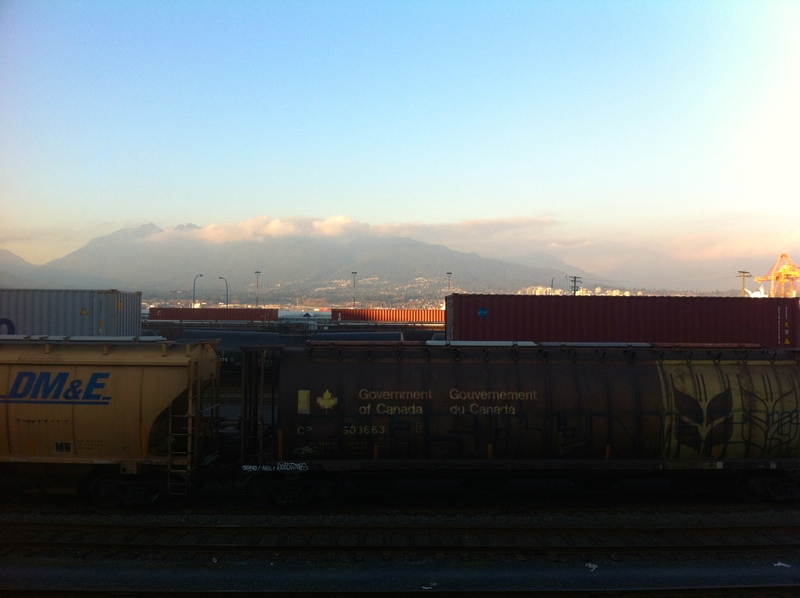 (1) View of the North Shore Mountains from Water St, Vancouver, Canada. By Agata Wierzbowski. 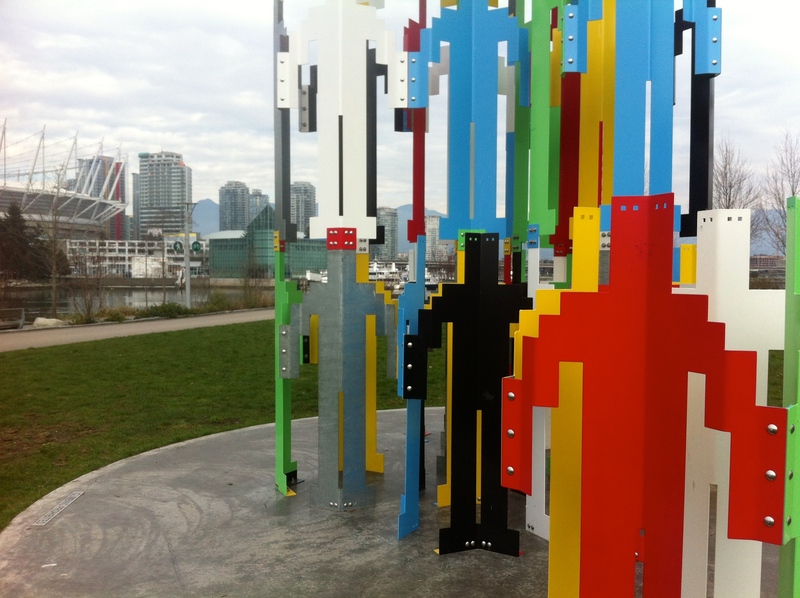 (2) Public sculpture overlooking BC Place, Vancouver, Canada. By Agata Wierzbowski. (3) UBC Reports, Volume 15, No 10 (27 March 1969), pages 6-7, online at <http://www.library.ubc.ca/archives/pdfs/ubcreports/UBC_Reports_1969_03_27.pdf&gt; last accessed on 27 February 2015.